There have been happy and sad times with comings and goings on the Museum farm this summer. To start on a happy note, a calf came to the farm early in the summer to give Clementine the cow company. 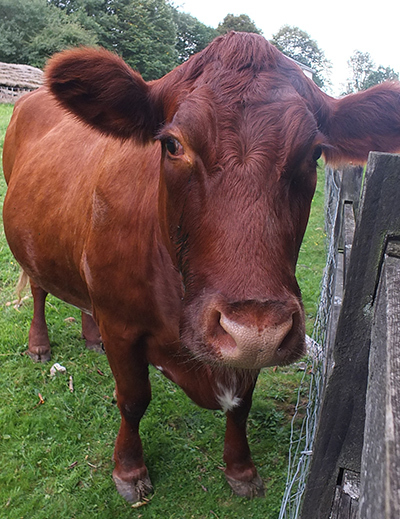 Both reddish brown, they can be seen at this time in the paddocks close to the farmyard. Clementine and the calf are getting along well together. With the birth of the Oxford Down lambs in the spring, grazing capacity was being pushed to its limit as numbers of sheep approached 50, far more than the Museum farm really has the space for. This was due to the delay in the departure of the Hoggets who finally left early in the summer followed by some of the ewes who were surplus to the farm’s needs. More recently some of this year’s lambs have departed as well as Gordon the ram. You may have seen Gordon, with his buddy Daryl, in the paddocks around the farm hoping for an ear rub from a visitor. 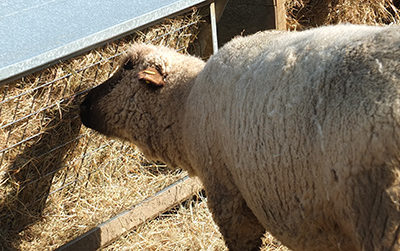 Gordon may well be pleased when he finds out that his new role will be to keep the ewes happy at his new home this autumn – as long as he can cope with so many ewes for company! This left his pal Daryl with no one to boss around – but only for a very short time. Two of the rams from this year’s lambs have recently joined him. They are getting on fine even though Daryl is happily putting them in their place as they attempt to be assertive. On the human front, the farm has also seen staff changes with a number of comings and goings. July saw the arrival of the Heritage Lottery funded farm trainee Josh Hayes who replaced the departing Lindsay Rule who came to the end of her 18 month traineeship. This lottery funded position, of which Josh will be the last trainee, has been a much welcome opportunity for the Museum in providing essential support for the farm manager. The post is an excellent opportunity for a young person to learn not only about farming and estate management, but also gain experience in an environment with visitors as well as how to manage and work with us volunteers. Finally, Conway Rowlands, the farm and site manager for 15 years decided to move on to fulfill one of his dreams away from the Museum. Conway was at the forefront of many of the farm developments bringing in many positive changes over the years. Conway has been replaced by Alaric Bowler who brings some exciting fresh thinking to the farm and estate management role with new ideas to enhance the visitors’ experience. Alaric is finding his feet and developing his plans and visitors will see some of these developments next year. Just to update regular readers of the farm blogs. The chickens are happy now having full freedom of their pen to peck around all day following DEFRA restrictions keeping them locked up earlier this year. And the goats? Well Crystal can be just as badly behaved as ever on her walks!